Homebuilder Services | Morris & Ritchie Associates, Inc.
Because the success of our clients is essential to our own success, we respond promptly and effectively to our clients’ requirements. We provide surveying, site and structural engineering, architecture, and landscape architecture geared specifically to the homebuilding industry. Builders are provided with graded home sites that minimize earthmoving costs. We also design lots with flexibility that allows a maximum variety of unit types on each lot. We regularly provide lists of options and unit types appropriate for each lot and marketing plans to aid builders and sales agents with the proper siting and selling of units. This flexibility allows our clients to better respond to buyers’ needs. 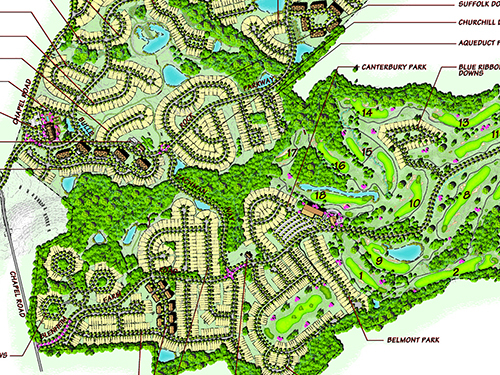 MRA provided planning, site engineering, landscape architecture, surveying, and homebuilder services for this 2,531-unit Residential Planned Community (RPC), 18-hole Championship Golf Course, and 460,170-SF Town Center Commercial district centered around Betts Pond. The design for the 664-acre site, in the Town of Millsboro implemented “Green Infrastructure” elements into the design, transforming stormwater management facilities into amenities / focal points for the project, thereby enhancing water quality and improving the aesthetics of the design. 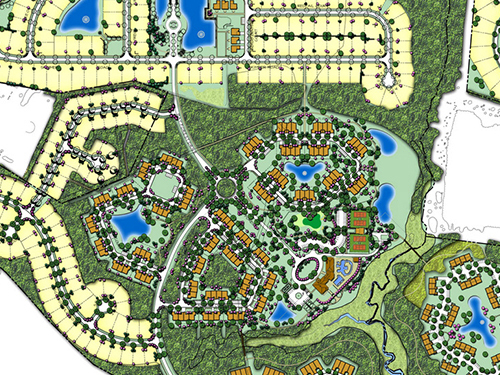 The Plantation Lakes community is being constructed over a 10-year period. 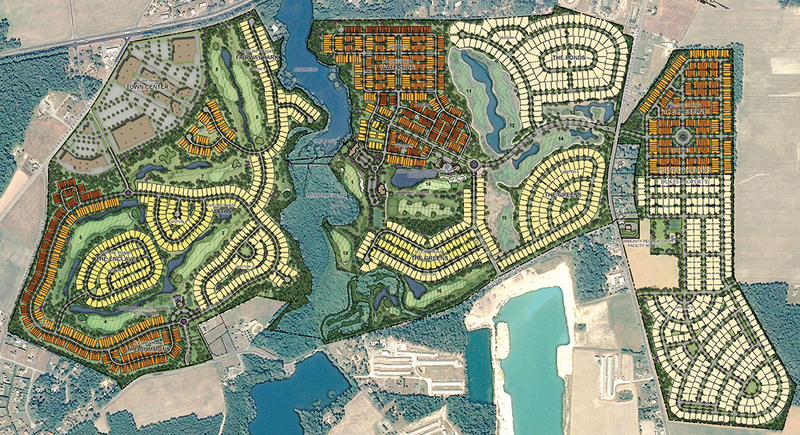 The initial phase includes a tree-lined entrance boulevard that meanders past ponds, golf holes, village greens, and over bridges to a central community center and clubhouse overlooking Betts Pond. The community center provides tennis, swimming, passive and active recreational areas, as well as, a clubhouse for the golf course. 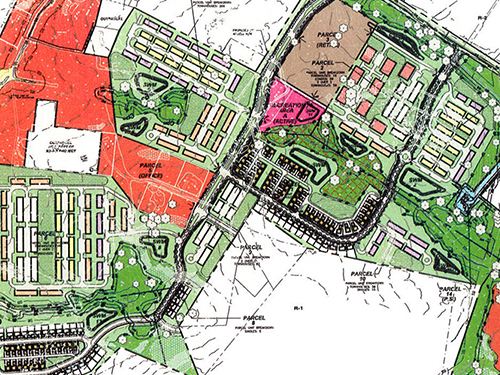 MRA provided land planning, civil engineering, landscape architecture, surveying, and homebuilder services for this 465-lot residential subdivision on 232 acres of land located on Irish Hill Road, near Magnolia, Delaware. The project was designed and engineered over two phases and also included an extensive floodplain study to determine the 100-year base flood elevations for an approximately 5 mile drainage area. The scope of the project also included perimeter berming along the state highway and a monumental entrance terminating on a central recreation complex and community center. 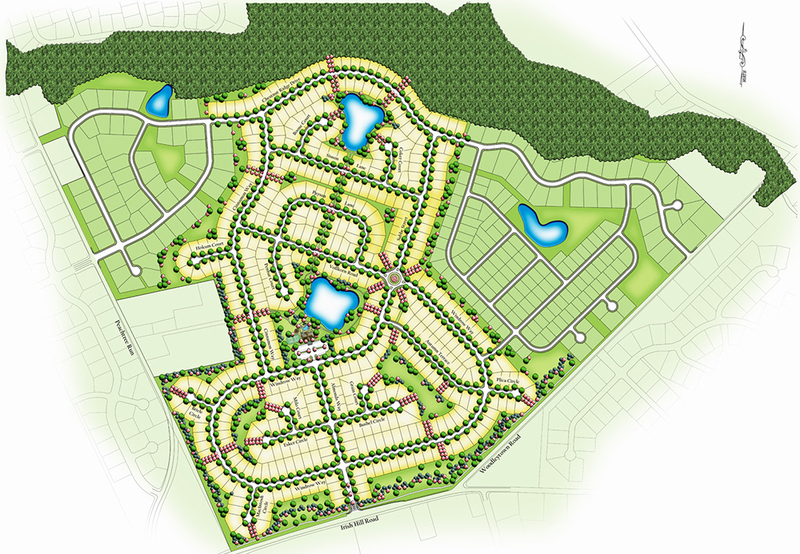 Tot lots, seating areas, open play fields, village greens, pond and forested stream valleys are linked by paths lined with flowering trees that add seasonal interest and define the corridors between lots. The main open space connector forms a strong axial relationship, visually connecting all amenity features from the entrance to the end of the property. Extensive off-site road improvements include lane realignments and a monumental roundabout. 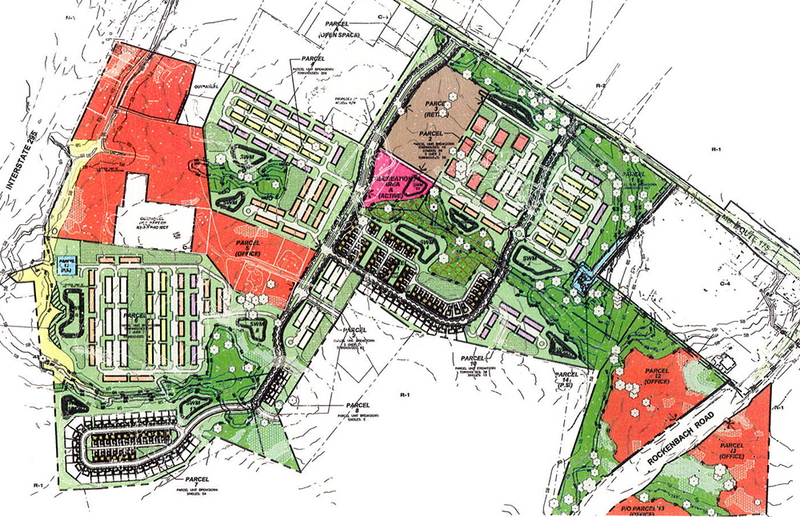 Parkside is a 250-acre mixed-use development located in Anne Arundel County, southeast of the MD Route 295/MD Route 175 interchange. The development consists of 1,003 market rate housing units, a 140,000-SF retail center, and 408,000 SF of office space. The housing units include multi-family condominium units, 20 and 22-ft-wide townhouses, two over two units, and single-family detached lots. 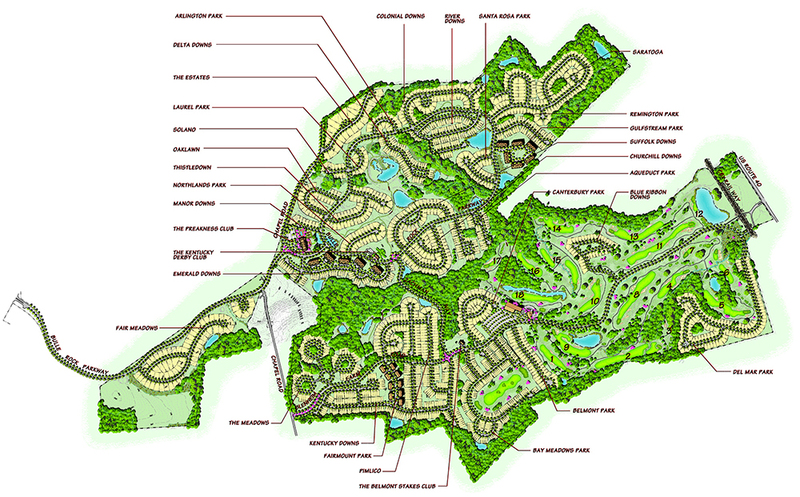 Various amenities are provided throughout the development such as an 8-ft-wide hiker/biker trail, community clubhouse and pool, seating areas, pathway system providing interconnections between parcel development, and public activity areas for non-residential uses. 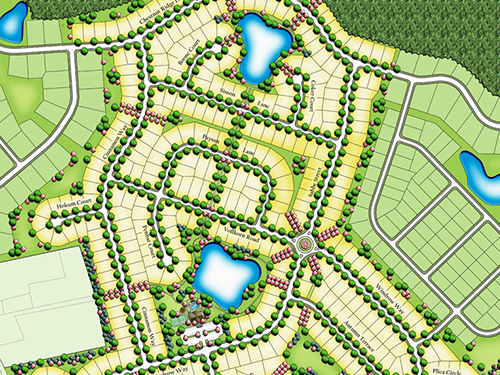 MRA has provided land planning, landscape architecture, civil engineering, surveying, and homebuilder services. We have prepared detailed design plans for road and storm drain; grading and sediment control; detailed site layouts; street tree, signage, and lighting; landscaping; streetscape; forest conservation; water and sewer; stormwater management; and subdivision plats. MRA prepared an overall master plan, detailed site plans for each residential/business neighborhood, and the community-wide amenity package, and homebuilder services for this award-winning residential community. 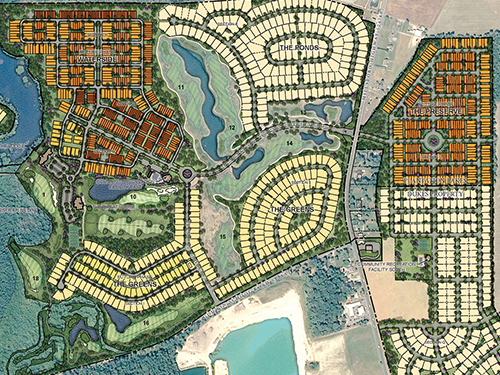 MRA prepared all of the detailed engineering and subdivision plans for submission to the City, and continues to assist in the implementation of each part of this award-winning community containing 927 single-family detached homes, 789 single-family attached homes, and 402 condominium units on 977 acres. The overall plan creates a series of individual neighborhoods so each builder has their own identity which is then inter-connected to all other neighborhoods and the community amenity program via an extensive open space network. MRA provided homebuilder services, land planning, engineering, and landscape architecture for this project which involves over 405 acres of land, designated as Environmentally Sensitive Developing Area in the County Comprehensive Plan. 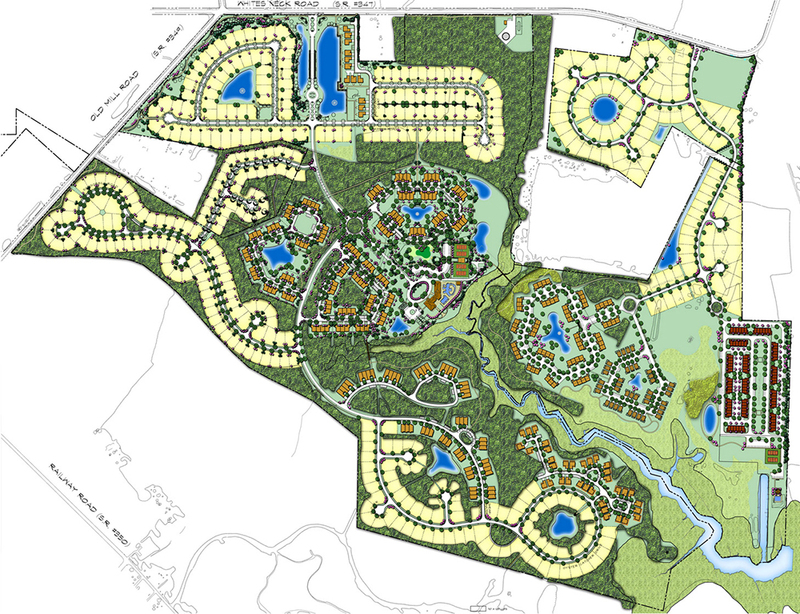 This 913-unit Residential Planned Community (RPC), focusing on environmental protection and enhancement, was designed to preserve over 139 acres (36%) of open space with 90 acres (50%) of the existing forest remaining for trails and passive open space. Through clustering and coving principles, an average 190-foot vegetated buffer was provided along Collins Creek, which serves as the dominant environmental feature.